[ Sir George Grove, music administrator and writer. ] Autograph Letter Signed ('G. Grove') thanking 'Mrs. Bartholomew' for correcting a score. On letterhead of Lower Sydenham, S.E. [ London ] 2 September [ 1878 ]. 2pp., 16mo. Bifolium. In good condition, lightly aged. The year has been added in another hand in pencil. Reads: 'Most grateful to you dear Mrs Bartholomew for all your kind care & thought. I have yet to go finally through the sheets and correct all it [sic] stopping &c. so that your corrections will be of great use – I am just off to America for a good long holiday. | Good bye | Yours very truly | & obliged | G. Grove'. [ Printed item, inscribed by the author ('G Vapereau'). ] L'Année Littéraire et Dramatique. Première Année (1858). Paris: Librairie de L. Hachette et Cie, Rue Pierre-Sarrazin, No 14. 1859.
viii + 491 + pp., 8vo. Aged and slightly damp-stained along the fore-edge. In worn calf quarter-binding, marbled endpapers. Inscribed on half-title 'A M. J de Vasconcellos | Hommage de l'auteur | G Vapereau'. [Compiler of Dictionary] Autograph Note, third person, to "Mr Cowper", re. autograph collecting. L.B. Phillips [Lawrence B. Phillips], compiler of "The Dictionary of Biographical Reference" (1871). [Printed heading] 12 Queen Square, Bloomsbury, 27 May 1871. One page, 12mo, minor staining, complete and clear. "L>B> Phillips persents his Compts. to Mr. Cowper and desires to inform him that not being a collector of Autographs her cannot assist in the exchange proposed. Mr P. has a large assortment of Fac-Similes". [ Samuel Lewis, topographer. ] Printed prospectus, questionnaire and list of 'Subscribers in London': 'Preparing for publication, | By S. Lewis, | A Topographical Dictionary of England, | From a Personal Survey through every Parish in the Kingdom'. 4pp., folio. Bifolium. In fair condition, on lightly aged paper and creased paper, with slight damage to margins at foot of both leaves. Beneath the heading on the first page is a list of around 75 princes, dukes and lords, headed by 'His Most Gracious Majesty the King', under whose 'immediate patronage' the work is to be commenced. Beneath this, in small type is the prospectus, stressing the 'immense Labour and Expense' attending the work (Lewis later claimed had taken six years to compile it, at an outlay of £48,000), which is to be 'published in Four Volumes Quarto - Price 30s. [Simplified Spelling Board, New York.] Twenty-five printed circulars, numbered 1-21, 23-25 (including two versions of 16), promoting English spelling reform. The twenty-five items printed by the Simplified Spelling Board, 1 Madison Avenue, New York, between 30 April 1907 and 30 September 1911. The Simplified Spelling Board was founded in 1906, funded by Andrew Carnegie, and counted Mark Twain and President Theodore Roosevelt, and the English lexicographers James A. H. Murray, Walter W. Skeat and Joseph Wright among its members. The present collection of the Board's Circulars consists of 25 uniform items, all unbound and stapled. The collection is in fair condition, on lightly-aged paper, with occasional wear. Stamps, shelfmarks and labels of the Board of Education Reference Library, London. Autograph Note Signed ('E Cobham Brewer. -') from Rev. Dr Ebenezer Cobham Brewer, compiler of 'Brewer's Dictionary of Phrase and Fable', thanking an unnamed correspondent for taking an interest in his work. Ruddington, Nottingham. 25 January 1881. 1p., 12mo. Good, on lightly-aged paper. Reads: 'Dear Sir | I have to thank you for the courtesy of your letter received by post this morning. It is always gratifying to an author when another takes an interest in what he has written'. Autograph Letter Signed ('C. S. Henry') from Caleb Sprague Henry. editor of the New York Review, to William Whitwell Greenough, accepting an article, but complaining of Greenough's handwriting, and of 'a difficulty in getting Saxon type'. New York; 26 April 1838. 3pp., 4to. Bifolium. 57 lines. Good, on lightly-aged paper. Addressed, on reverse of second leaf, to 'William W. Greenough | Andover | Massachusetts', with circular postmark in red ink and remains of red wax seal. Regarding 'the article on Bosworth's Anglo-Sax. Dict. ', Henry writes: 'From the few first pages that I have read & the glance that I have given at the rest, I am satisfied that I shall be glad to print your article. DICTIONARIES and GRAMMARS Catalogue 891 [500 Books on Linguistics and the Diversity of Tongues]. April 1964; London: Maggs Bros. Ltd. 50 Berkeley Square, London, W.1. 8vo. Pages: [2 +] 142. Frontispiece and fourteen full-page plates on art paper at rear. In good condition, in original green printed wraps, worn and torn and with closed tear at head of spine. A few marks in soft pencil. An invaluable scholarly production. Autograph Card Signed and Letter in another hand Signed (both 'Sidney Lee'), both to John Henry Fowler. 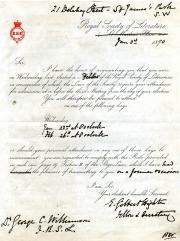 The Card, 26 July 1920; the Letter, 17 November 1921; both on letterhead of 108a Lexham Gardens, Kensington, London, W.8, but with the letter's address altered to 2, First Avenue House. The Card is good, apart from two rust stains at the head from a paperclip. Stamped and postmarked, and addressed to Fowler at 16 Conynge Square, Clifton, Bristol. Six lines. Concerns Lee's sister Elizabeth, a writer of textbooks, translator and contributor to the Dictionary of National Biography, whose death on 10 July 1920 was, according to the New DNB, 'a source of much sorrow' to Lee. 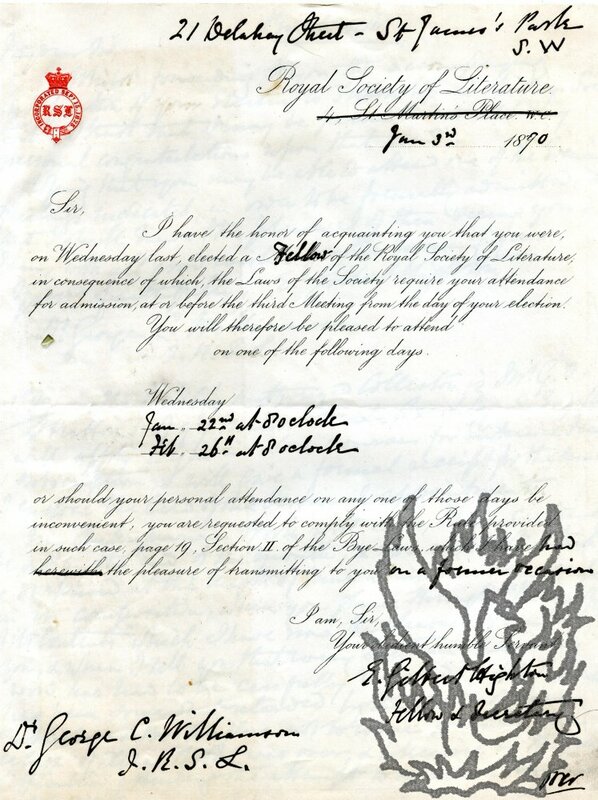 He thanks Fowler for his letter of sympathy, adding that his sister 'greatly valued her association' with you Fowler and his 'approval of her work'. Autograph Letter Signed ""Coblence" to John Bellows, Printer and publisher (of a pocket French Dictionary), Gloucester. Paris, 19 Rue des Missions, le 11 Juin 1877. En francais. Printer ("electrotype"). Four pages, 8vo, a few letters masked by a strip of brown paper on the last page, mainly good condition. A stamp (timbre) is stuck top left of page 1, with the image of an electrotype machine surrounded by the name "Victor Coblence" and the word "electrotypie". The contents of the letter indicate a close business relationship and contain many technical (printing) terms. In the first paragraph he discusses Sutton & Co and "la caisse renfermant la forme [a?] la cliche". English actress (1852-1930), sister of Ellen Terry and member of celebrated theatrical dynasty. Fragment of letter, one page, 16mo, of irregular shape. "[...] but I did & do wish you every success dear child & thank you so much for your sweet thoughts of me = / Yours with love / Marion Terry". Remains of mount to the blank reverse. English actress (1852-1930), sister of Ellen Terry and member of celebrated theatrical dynasty. One page, 12mo. Evidently in reply to a request for an autograph. "Yours truly / Marion Terry". "I will carefully consider the suggestion and if the need arise will communicate with you again. | Yours faithfully | Sidney Lee"